Synopsis: Seeking revenge on those who took his command away, Capt. 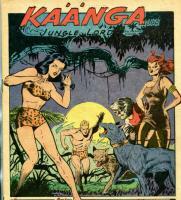 Damon and his twin daughters wreak havok throughout Kaänga's jungle. Credits: Script: ? 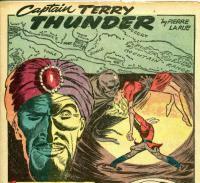 [as Frank Riddell] | Pencils: John Celardo (signed) | Inks: John Celardo (signed); Bob Lubbers ? 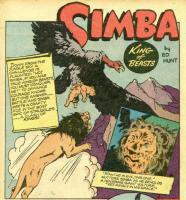 Synopsis: Simba defends a regal vulture against jackals and gorillas, but when the vulture takes one of Simba's cubs, the king of the beasts traps and kills the bird. Comic Story (7 pages) The Dirge of Death! Synopsis: A list of the fastest animals. Synopsis: A white slaver masquerades as a priest of Ruki, who demands sacrifices. He takes the sacrifices and sells them as slaves. Wambi is taken but calls on the animals in the slavers' camp to rebel. Synopsis: Tabu prevents a witch doctor from overthrowing his chief. Credits: Script: ? 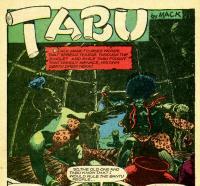 [as Mack] | Pencils: Howard Larsen (signed) | Inks: Howard Larsen (signed); ? Synopsis: A map of Africa showing the locations of several species. Synopsis: M'Kuba the witch doctor conspires to take over the tribe with the help of the Dwarf Men. Camilla exposes his plot. Credits: Script: ? [as Victor Ibsen] | Pencils: Fran Hopper | Inks: Fran Hopper ? ; ?